While on a business trip to the UK, I knew I would have a weekend off to explore the area and whomever I asked where I should visit, everyone of them said Edinburgh. So with that advice I booked a train up to Edinburgh and couple of nights at a city center hotel. Get lucky, with the weather that is. From what I have been told, England is having an unusual period of clear sunny weather. This great weather extended up north to Scotland as well. While I was there, all the locals kept commenting how rare and beautiful the day was. Apparently, Edinburgh gets around 125 days of rain per year and when it is not raining, it is usually cloudy and overcast. In fact, the very night before, I came for this same shot and found the conditions unfavorable with overcast skies the sun was not able to penetrate. This composition is not entirely original as it is on many postcards and posters, but there is certainly a reason for this as it is a strong composition and really captures the beauty of this magnificent city. I paid particular attention to how I placed the elements of the city into the scene. There is a 30 foot section of the ledge where you can get similar compositions, but found this one captured the key structures of the city the best. In the foreground you have the Dugald Stewart Monument and going to the right the A7 Bridge, obelisk at the Old Calton Burial Ground, the buildings along Market Street, The Hub (Gothic spire), Edinburgh Castle, the Balmoral Hotel Clock Tower, and Scott Monument. Getting all these elements into the scene unobstructed required walking around a bit with the camera to my eye (for this exact location see below). Aside from the city, I was fortunate to have the crescent moon in the frame as well! The sun was setting almost directly camera right which resulted in the faces of the buildings glowing in a golden yellow hue. Due to the difference in brightness in the sky versus the city, I had to use a 3-stop soft graduated ND filter. This allowed me to get this shot in one exposure without the need for HDR. The shot was made shortly before sunset and although hand holdable at 1/4s (dozens were doing this along with a half dozen of us with tripods), a tripod helped me get the exact composition I wanted and gave me a tack sharp image. I made several exposures beginning around 40 minutes prior to sunset up until sunset at 5 minute intervals. When I arrived home, I picked the one with the best quality of light, paying particular attention to color and how the light was hitting the buildings. The image above is what I chose and it was taken approximately 15 minutes prior to sunset. Thanks for stopping by Heather. 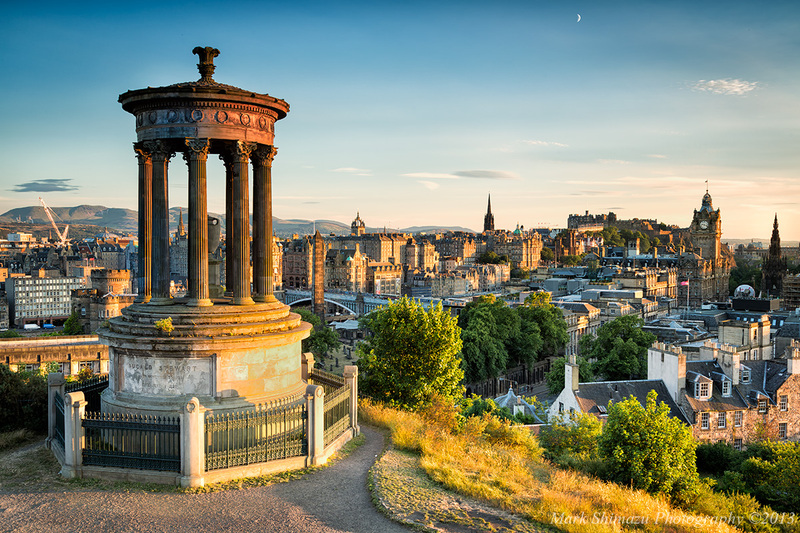 I first saw an image of Edinburgh from Calton Hill a couple of months ago on another WordPress Blog. I thought back then that it was such a beautiful scene and how I would love to photograph it. Little did I know a short two months later I would be in that exact spot. Kind funny how things worked out. You paint gorgeous scenes through your camera lens – this is spectacular. The lighting is perfect – congratulations. Thanks Mary. I was very fortunate to get great weather and a beautiful sunset. A classic shot, wonderfully executed – I particularly like the tiny detail of the crescent moon, it’s the perfect finishing touch. Thanks. I like the little additional touch that the crescent moon added as well. I was very fortunate to have a nice clear day. Edinburgh is a beautiful city. My wife and I spent a couple days there on our honeymoon. On our last night we walked up to this park and got some lovely images. The architecture is fantastic and completely different to what we are used to back home. It is a great shot, Mark. I’m glad you got a chance to visit this wonderful city. Thanks for stopping by and commenting Colin. Yes, Europe has architecture that we do not have in North America. It makes wandering the streets such an awe inspiring experience. So much history and charm. A place I know very well Mark. Fabulous picture! Thanks. Weather has been great in your part of the world this past couple of weeks! A lovely shot. HDR right? I love it!